The Season has officially arrived in the Palm Beaches and with it come the nonstop celebrations, exuberant parties and entertaining activities. 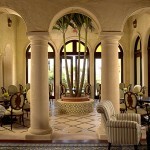 Nowhere is this more evident than at the intimate Club at Old Palm Golf Club, a veritable hub of the social scene. âOur opening weekend dinner dance kicked off what we are sure will be our most exciting Season yet,â said Darlene Impellittiere, General Manager. âOur members are passionate about this Club and are genuinely thrilled to be back. Members and guests enjoyed an evening of dining, dancing and a spectacular fireworks display. Old Palmâs Opening Event was the perfect start to the Season and set the stage for the rest of the Clubâs event schedule. It was great to see our members together again, rekindling friendships and most importantly welcoming all our newest members.â Old Palm is the premier private Club community in the Palm Beaches, yet the atmosphere is anything but stuffy or reserved. Every Wednesday is Pub Night, a light-hearted casual evening that often spills out onto the Event Lawn for some enthusiastic bungee-jumping. Other affairs may be more formal, but theyâre still great fun, first and foremost. During the day, members may be found indulging in spa treatments and working out in the Clubâs extraordinary fitness center, where classes range from Pilates to yoga. The Ladies Book Club frequently meets in the inviting Womenâs Lounge to discuss the latest bestsellers. Other members may gather at the Club for lunch before or after a round on Old Palmâs spectacular Raymond Floyd-designed golf course. Thatâs the beauty of the Club. Itâs a welcome blend of tradition and contemporary luxuries that feels like home, so itâs ideal for all sorts of activities. Designed to mirror the intimate scale of a Palm Beach estate, the Mediterranean-style Club encourages members to mingle in its casual, pleasantly understated atmosphere. âOur members feel as if the Club is âa home away from homeâ or simply an extension of their homes. It is not only comfortable, but also inviting and most importantly accommodating for their every need,â continues Impellittiere. âItâs the perfect venue for any event, including sophisticated affairs, private dining in the cozy Wine Room next to the wine cellar, and fun-filled get-togethers for the whole family.â The holidays are particularly special at the Club, which is always beautifully decorated in accordance with the occasion. As always, on Thanksgiving there is a bountiful dinner buffet, a full five-hour affair featuring every imaginable dish, exquisitely prepared by the chefs. Similarly, the Hanukkah dinner is one of the most anticipated events during the Jewish holidays, and the Christmas Eve dinner buffet is another well-attended highlight. Of course, one of the biggest celebrations is New Yearâs Eve. This year, the evening will begin with cocktails at the Club, followed by an elegant dinner and dancing to Headliners, the Palm Beachesâ most sought-after live band.